Find out who will win today’s match? Welcome to crix11.com. In Today Dream11 Fantasy Cricket Prediction KKR vs KXIP 18th T20 Match IPL 2018 we will cover expected playing 11, pitch report of Eden Gardens, Kolkata, what astrology has to say on the toss, dream11 best team. We will also cover players recent and past performance, Key players, weather report of Kolkata, the best choice for captain and vice-captain, dream11 guru forecast, all the latest news and updates related to 18th match of IPL, where to watch the live match of KXIP vs KKR and live streaming details. Don’t miss any details of this post if you really want to win in any fantasy leagues. At Least make sure to read the key players section if you want 100% results. All the information in crix11.com is absolutely FREE so it’s a win-win situation for you. Who Will Win the 18th Match of IPL 2018 Between KKR vs KXIP and Toss Prediction? What is the best combination of players for Dream11? 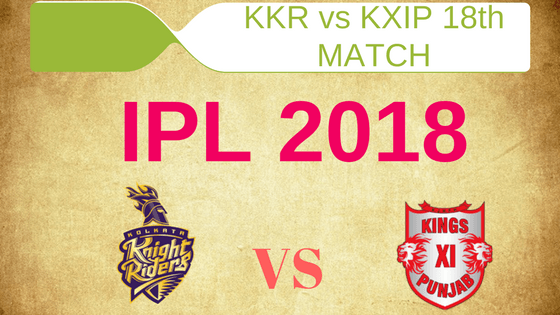 Match: Indian Premier League, KXIP vs KKR, IPL 2018. The last match played on this pitch was a high scoring game. The pitch will favour the seamers in the initial stage of the innings but if batsmen handled the seam, then again you can see a high scoring game. In previous games, the spinners also took wickets in this ground. Fast bowlers and batsman will dominate today’s match. Cricket fans have to keep their fingers crossed as scattered thunderstorms are expected in between. It will be mostly cloudy in the morning and sunny in the afternoon. There is almost 50% chance of rain during the time of play. The temperature is expected to be 35-Degree Celsius and humidity to be 71% which may go up to 81%. If we look at last five matches KKR is head of KXIP. KXIP has won one game out of five games whereas KKR has won four matches out of five matches. Kolkata Knight Riders have won 14 times and Kings XI Punjab has won 7 times against each other in whole IPL. Even in Eden Gardens Dinesh Karthik team has a better record. KKR has won 7 matches whereas KXIP has won 2 matches. It will be interesting to see which team improves their record today. Star Sports has paid a huge amount of INR 16,347.50 Crores to get exclusive rights of IPL 2018 for live coverage for five years starting from 2018 to 2022. Star Sports has all the media rights including TV and all Digital Rights. You can watch the full match of Kolkata Knight Riders vs Kings XI Punjab on Star Sports. Chris Gayle, Mujeeb Ur Rahman, Lokesh Rahul (wk), Mayank Dagar, Ravichandran Ashwin (c), Marcus Stoinis, Mayank Agarwal, Andrew Tye, Akshdeep Nath, Karun Nair, Pardeep Sahu, Aaron Finch, Axar Patel, Manzoor Dar, Yuvraj Singh, Ankit Rajpoot, Barinder Sran, Ben Dwarshuis, David Miller, Mohit Sharma, Manoj Tiwary. Chris Lynn, Dinesh Karthik (c & wk), Andre Russell, Javon Searles, Sunil Narine, Tom Curran, Robin Uthappa, Vinay Kumar, Cameron Delport, Nitish Rana, Shivam Mavi, Shubman Gill, Rinku Singh, Mitchell Johnson, Piyush Chawla, Ishank Jaggi, Apoorv Wankhade, Kuldeep Yadav, Prasidh Krishna. Both the teams are in top four on the points table and doing fairly well. KKR has won back to back games and the situation is same for KXIP. Universal Boss Chris Gayle is in the best form and this has boosted Ashwin’s confidence. On the other hand, cricket experts are raising questions against Dinesh Karthik leadership. It will be interesting to see how Karthik proves the critics wrong in today’s match. KKR has won back to back two games in a couple of days. There is a very less chance that they will change the team. Why fix if nothing is broken. Dinesh Karthik will go with the same playing 11 until and unless there is a fitness issue before the game. Robin Uthappa, Chris Lynn, Kuldeep Yadav, Andre Russell, Sunil Narine, Shubman Gill, Shivam Mavi, Nitish Rana, Tom Curran, Dinesh Karthik (c & wk), Piyush Chawla. Yuvraj Singh has disappointed his fans as well as his franchise but Ashwin and Sehwag have backed him and supported him. KXIP may think of playing Manoj Tiwari in place of Yuvraj Singh but this is unlikely to happen as KXIP has won their last two games and they may not want to change their team. Karun Nair, Lokesh Rahul (wk), Mujeeb Ur Rahman, Chris Gayle, Ravichandran Ashwin (c), Mayank Agarwal, Andrew Tye, Aaron Finch, Manoj Tiwary/Yuvraj Singh, Mohit Sharma, Barinder Sran. Lokesh Rahul: KL Rahul had a great start in this IPL. In last 4 innings, he scored 153 runs. He scored 18 runs in the last match and contributed 12.5 points. 73.72% of the users have selected him in their dream11 teams. Dinesh Karthik: Dinesh Karthik scored 151 runs in last five matches. He scored 42 runs in the last game and contributed 32 points. 26.28% of the fantasy users have chosen him. Pro tips: It is expected that it will rain today and the overs could be reduced. So in this situation, KL Rahul is a good option as he bats at 1st down and is a pinch hitter. For multiple teams make a combination of the above players. Chris Lynn: Chris Lynn has scored 107 runs in last five innings. He scored 0 runs and contributed 0 points in the last match. 69.29% of the dream11 users have picked him in their teams. Aaron Finch: Finch is one of the top batsmen in T20 cricket. He scored 14 runs in the last inning and contributed 14.5 points. 16.2% of the users have selected him. He scored 48 runs in the last game and contributed 31 points. 78.38% of the users have taken him in their teams. Robin Uthappa: He scored 48 runs in the last game and contributed 31 points. 78.38% of the users have taken him in their teams. In the last 5 innings, he has scored 128 runs. Chris Gayle: Universal Boss is back. What an inning he played in the last match. He scored 104 runs in the last game and contributed 73.5 points. He scored 167 runs in last two matches. 86.99% of the users have taken him in their teams. Nitish Rana: One of the most reliable batsman. He scored 162 runs in the last 5 innings. In the last match, he contributed 46.5 points and scored 35 runs and took 2 wickets. 84.84% of the users have chosen him in their teams. Mayank Agarwal: Manyank Bats at 3rd down for KXIP and he is in a good form. He scored 70 runs in last 4 games. He scored 18 runs in the last match and contributed 14 points. 16.09% of the users have taken him in their dream 11 teams. Karun Nair: Nair scored 139 runs in last 5 innings. He scored 31 runs in the last match and contributed 20 fantasy points. 48.11% of the users have selected him in their teams. Pro tips: It may rain today so try to keep top order batsmen. For multiple teams make a combination of the above players. Andre Russell: When Russell plays he plays big. He scored 153 runs in last five matches and took 1 wicket. He has a potential to score big against any team. 87.4% of the users have selected him in their teams for today’s match. Sunil Narine: Today Narine will again open for KKR team. He scored 107 runs, took seven wickets in the last five games. He scored 35 runs in the previous match and contributed 20 points. 91.75% of the users have taken him in their teams. Pro tips: Try to keep both the players in your teams. For multiple teams, you can select from playing 11 also. Kuldeep Yadav: In last 5 matches Kuldeep took 6 wickets. He contributed 17 points in the last game and took one wicket. 85.25% of the users have selected him in their teams. Andrew Tye: Andrew Tye has not been that much effective this season of IPL but he managed to take 5 wickets in last 4 games. He took 2 wickets in the last inning and contributed 23 points. 59.89% of the users have selected him in their dream11 teams. Mujeeb Zadran: Mujeeb failed to take wickets in the last couple of matches. 52.91% of the users have selected him in their teams. Mohit Sharma: Mohit Sharma took 5 wickets in last 5 innings. He took 2 wickets in last game and contributed 19 points. 30.52% of the users have selected him in their teams. Barinder Sran: Only 2.82% of the users have selected him in their dream11 fantasy teams. Pro tips: The above players are most likely to perform. You can take them as captain and vice-captain. KXIP record in Eden Garden is not that good. In 9 matches they have only won 2 matches. According to cricket expert, KKR will win the match but according to our astrology prediction, KXIP will win today’s match. The trend of winning the toss and win the match has been changed in the last couple of matches. Ashwin proved that they can win matches batting first. In today ’s match, If Karthik wins the toss he will choose to bowl first. According to crix11 prediction, Ashwin will win the toss and he will bat first. The pitch of Edens is very good for batsmen but it will also support the seamers initially. The pitch will slow down in the latter half and start favouring the spinners. So the best combination is to select the hard and pinch hitters in your team and make a combination of seamers and spin bowlers. Conclusion: This is it for Today’s Dream11 Fantasy Cricket Match Prediction of KXIP vs KKR, 18th T20 Match, IPL 2018 which will be played on Monday 21st April. You can give your valuable feedback in the comment section. Subscribe to our notification of latest updates. GOODBYE!